In which Miles finally makes it to Battlepod; we delve into our favorite continuity snarls for the benefit of the Beyonder; Kang is everyone; we’re really grateful that the D.C. Multiverse is out of our usual scope; someone gets a new costume; and the Secret Convergence on Infinite Podcasts reaches its shocking conclusion! Featuring Paul O’Brien of House to Astonish and Kieran Shiach of Journey Into Misery; with Greg Rucka as the voice of the Beyonder! This is the final episode of the Secret Convergence on Infinite Podcasts, a nine-part crossover event featuring the bravest and boldest of comics podcasts. You can find a list of the previous #SCOIP episodes–and where to jump into participating podcasts–on our blog! ART CHALLENGE: Miles apparently came home from Secret Convergence with a snazzy new costume that may or may not be a hostile alien symbiote! What does it look like? In which All-New Wolverine remains superlative on every front; and just because Moon Girl and Devil Dinosaur is adorable doesn’t mean it’s not important. Get Ready for the Final Episode of the Secret Convergence on Infinite Podcasts! Jay here! I can’t believe we’re going to be wrapping up the Secret Convergence on Infinite Podcasts this coming weekend! The crossover has been such a constant for the last many months, and seeing it take life over the course of November has been amazing. Our episode will be up on Sunday, November 29. Meanwhile, we’ve put together a field guide to the Convergence so far–and what to listen to if you fall in love with any of the podcasts involved! EPISODE THREE: Are Things Better or Worse? 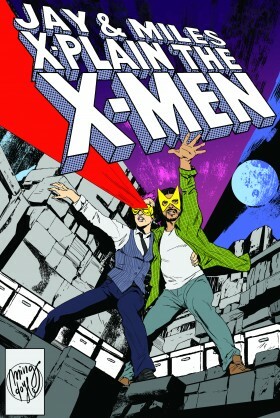 EPISODE NINE: Coming soon on Rachel & Miles X-Plain the X-Men! In which we’re still having trouble getting into Extraordinary X-Men; Deadpool & Cable: Split Second is kind of delightful; and Wolverine gets mauled by a bear. Remember that awesome Dazzler music video that came out last year? There’s a second one in the works–and director Arvin Bautista is looking for extras to be audience members at a concert.